This is my personal review of home remedies to fight plant lice on my succulents. I'm trying out onions as well as lavender, if those remedies don't work, I'll move on to garlic. Observation helps: If I'd taken action when I first noticed the white fluff around the roots of this plant (image on the right), I would not have had this big an infestation to deal with now. White fluff: probably plant lice eggs. I did some background checking on plant lice (in Dutch) and it seems plant lice fly, so there's no guaranteed way to prevent a new infestation once you've gotten rid of the old one. See however the information on lavender below. Plant lice are insects and the home remedies used to get rid of them rely on that fact alone. Plant lice come in all sorts of colors: black, green, purple and white. 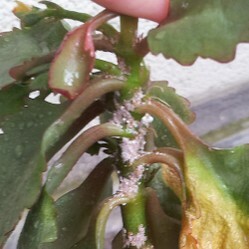 My current infestation consists of white plant lice on three of my succulents. Plant lice will infect plants most when they're not quite healthy: under watered, over watered, too much food in the soil etc. This is my report of using only natural remedies to get rid of them. Tobacco: putting a plant in a plastic bag and closing it right after lighting a cigarette inside is supposed to work like a charm. You're poisoning the air as well as getting rid of oxygen: I doubt the insects will live. Tobacco: Letting tobacco sit in water so it becomes a sort of soup and then spraying that soup onto the plants. Onions and garlic: the smell of these foodstuffs will drive insects off. More about the method of using onions later. 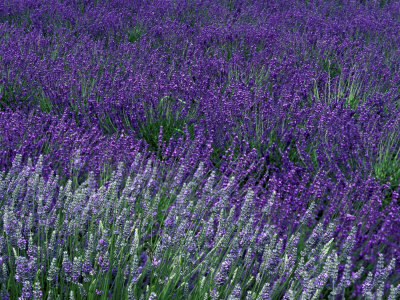 Lavender: the smell of lavender too scares insects off. Organic soap: not why, but it works better than your average detergent. See below. The best thing I can say about the onions method is that my plant lice didn't multiply and do seem to have diminished a bit after a week. However, For now I'm back with the old organic soap trick. More on that later. I suspect the mushing of the unions may be part of why my method didn't work. Or maybe my plant lice are a different species from the ones that my online sources had. I'm now back with old fashioned soap - organic soap to be precise. I don't mean the lavender smelling soap bars for in the bathroom. I mean the type of soap your grandmother used to clean the kitchen. It was organic in that it wasn't made from petrol. The only thing close to this type of soap I've been able to find in English are soap nuts. See this wizzle on organic aphid control. In Dutch it's either green soap or soft soap. That is: soap based on Glycerin. I found one liquid soap that fit the prescription on Amazon: Grabgreen dish soap. See below. This method can be used with very little to change it with garlic or tobacco. In both cases using a mixer to make the parts as small as possible is a good idea. In the case of tobacco I'd let it sit longer and put some soap in the water to make more of the chemicals in the tobacco dissolve into the water. Garlic can of course also be used in a much simpler way: just put a clove of garlic in the soil of the plant you're trying to save. However, I'm not sure I'd trust that method in the case of an infestation like mine. Spraying seems absolutely necessary. I did put lavender plants near my infected plants. The lice staid on, so this method won't help you get rid of aphids, though it may be good enough for prevention. Plants smell for the same reason that garlic and onions do: to protect themselves against insects. No wonder then that they help in protecting other plants as well. There is a reason onions and garlic are popular in food all over the world and it's not just the taste: both these foods have properties that will drive off insects and bacteria. Over the most of human evolution humans did not have refrigerators, so they had to make do with natural ways to keep their food healthy. Onions and garlic help tremendously. So here's how to use onions and or garlic to drive off plant lice. One onion is enough for a quarter gallon remedy: enough for spraying a dozen plants several days in a row. Skin the onion and the garlic as you would if you were using them for a meal. Chop the onion into pieces small enough for chopping into mush mechanically. Add water enough till you have a quarter gallon (aka a liter) of mush. You'll note that the water becomes yellowish: that's the onion stuff you want. 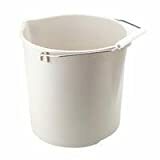 Put a cloth on a small pot or bucket. (see picture above) I used an elastic band, but rope will do as well. Let the onion stuff sit for about 15 minutes (probably not necessary in this method, but it can't hurt). Poor the onion stuff onto the cloth over the bucket. The water will go through the cloth. Once most of the water is through, gently take off the cloth with the mush left inside and squish the cloth to get the last drops of moisture out. You now have a clear yellowish liquid in the bucket and onion mush in your cloth. We'll spray the liquid on the plants while a bit of the onion mush is spread on the soil of the infested plants. Personally I choose to spray all my plants: I don't want to get rid of lice on one plant only to have them move house to another. Spray the plants every other day for at least a week. These are all kitchen basics, so if you don't have them, you might as well get them. My onion solution started fermenting within days, causing the spray bottle to run over. You may be able to prevent this by simply putting the solution in the fridge. Personally I opened the bottle so the pressure no longer pushed the solution out of the spray. Unfortunately only the soap water spray method works reasonably well: it gets rid of MOST of the plant lice on my succulents. I've had to keep spraying to get that effect though. That's the problem with not getting rid of all of them, I'm afraid. Adding turpentine to the mix - making it a soap-turpentine spray - seems to get rid of the last stragglers. "Aphids, also known as plant lice and in Britain and the Commonwealth as greenflies, blackflies or whiteflies, (not to be confused with "jumping plant lice" or true whiteflies) are small sap sucking insects, and members of the superfamily Aphidoidea. Aphids are among the most destructive insect pests on cultivated plants in temperate regions. The damage they do to plants has made them enemies of farmers and gardeners the world over, but from a zoological standpoint they are a very successful group of organisms. Their success is in part due to the asexual reproduction capability of some species." What is your favorite method for getting rid of plant lice?